At some point, Magic Leap is going to have to let people play around with its ultra-secret mixed reality device. Dev kits are now shipping to select partners, so it would seem that time is now. But the chosen few are required to take extra security precautions that make it unlikely you’ll bump into one of the headsets at a party. Late last year, Magic Leap made news by showing us the first images of its long-in-the-works miracle tech, and it promised that developers would get their hands on it sometime in 2018. Earlier this month, it released an SDK, and it seemed that the ship date couldn’t be far away. Now, a Bloomberg report says that some priority developers are getting their units, but Magic Leap is insisting that it be kept locked in a safe. The security requirements associated with being an early user were deemed too burdensome by some developers. 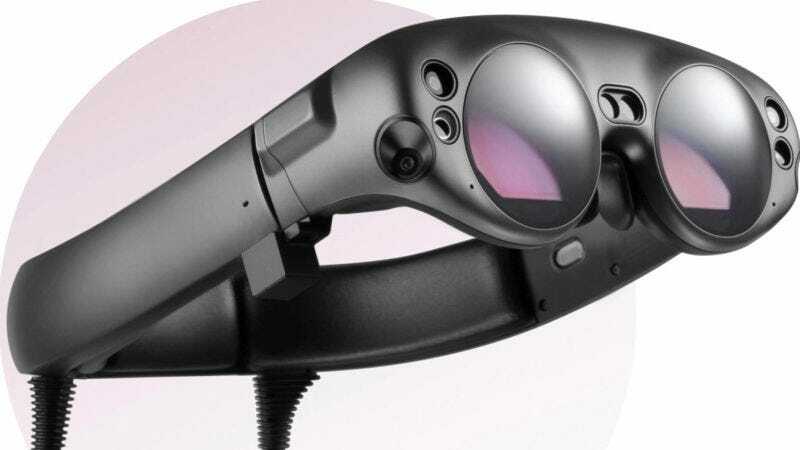 At least one company decided it wasn’t worth the hassle and declined a test device, said a person familiar with the matter, who asked not to be identified due to Magic Leap’s tight information rules. A Magic Leap spokesman confirmed the company has given out a limited number of devices to partners and has not started distributing them widely. Up to this point, the startup has only allowed people to use the product in tightly controlled environments. Investors, potential business partners and journalists who have used prototypes typically have only been able to do so after signing nondisclosure agreements. We’ve reached out to Magic Leap to confirm that some developers have decided to pass on the opportunity and we’ll update this post when we receive a reply. We also asked if developers are required to sign an NDA. In February, Magic Leap CEO Rony Abovitz and Adam Silver, the Commissioner of the NBA, appeared at a Recode conference to promote a joint initiative that’s in the works. It was an embarrassing episode because neither was willing to really talk about anything in detail. At one point, Silver even said he signed the same NDA as everyone else, and he was only allowed to speak in vague language. This is not how you promote a product, it’s how you convince people that you have something to hide that’s not good. The Magic Leap hype train has officially jumped the rails, and the old “no such thing as bad publicity” adage couldn’t be more wrong. There’s a general feeling of indifference in the press and with online observers. Magic Leap seems to be reading that as anticipation. The only time we get real information about the company is when an employee sues them. The reality is, the Magic Leap One probably won’t be impressive straight out of the box—that’s just life. Microsoft’s HoloLens has been in the hands of developers for two years, and it’s still not blowing anyone’s mind. If you have a developer friend who has a unit or $3,000, you can try the HoloLens out for yourself. Otherwise, it’s fun to watch the device’s progress through videos uploaded by people quietly chipping away at their personal projects. All available evidence has left us skeptical that Magic Leap is about to ship Ready Player One-worthy tech yet. And if HoloLens continues to be more friendly to developers, it likely never will. Will Lasers Save Intel&apos;s Google Glass Clones From Sucking? Is Magic Leap Having a Nervous Breakdown or Making an Announcement?